Kingdom Hearts will be getting the FigPin treatment later this year. 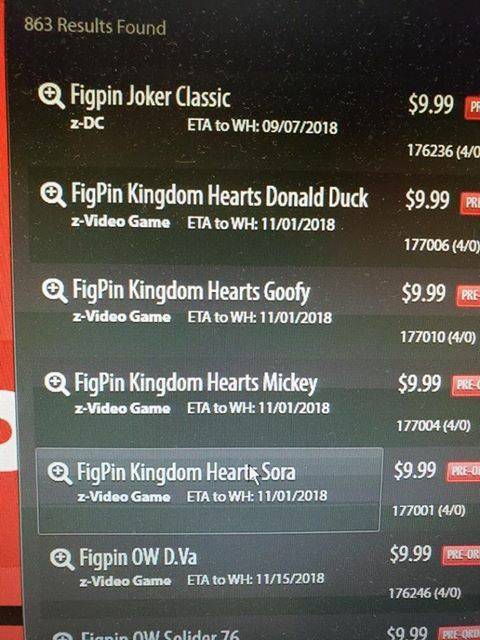 An anonymous source emailed us with photo evidence showing that Gamestop have four Kingdom Hearts FigPins available for pre-order in their system. Sora, Goofy, Donald Duck, and Mickey are expected to cost $9.99 USD each and have an estimated release date of November 1st 2018. Follow Kingdom Hearts Insider on Facebook and Twitter for the latest updates on Kingdom Hearts Union X[cross], Kingdom Hearts III, and all things related to Kingdom Hearts! Must have *. * Also Mickey but no Riku on the list? These are very cool. I don't usually buy KH merch, but these are cheap and look good. As long as they don't look totally stupid (looking at you, Diamond Select KH toy line), I'm buying in!